Sandra Mastrogiuseppe is a partner in the Litigation practice group. Sandra specializes in commercial litigation and arbitration as well as in the field of intellectual property (trademark) litigation. She has extensive experience pleading before the Superior and Appellate courts of the Province of Québec, as well as before the Federal Court of Canada. Sandra has been involved in a broad range of complex files, including contractual conflicts, injunctions, seizures, product liability claims and shareholder disputes. As part of her shareholder disputes practice, Sandra regularly advises clients on a variety of available oppression remedies. She is also consulted on a regular basis to recommend viable alternatives and business solutions, as may be required. Sandra has represented a wide range of public and private companies, including BCE Inc., CGI Group Inc., Dollarama L.P., First Capital Realty Inc., Groupe Dynamite, Home Depot Canada Inc., I.M.P. Group Limited, Jesta Capital Corp., Le Château, and Reitmans (Canada) Limited. Sandra is President of the Board of the Centre Booth and l’Abri d’espoir, Montreal-based shelters affiliated with the Salvation Army. She also acts as a Chair for Concordia University’s Student Tribunals, overseeing academic disciplinary hearings. Fluent in Italian, Sandra enjoys playing an active part in the Italian community. She is a member of the Centre culturel de la Petite Italie-Casa d’Italia, an institution which has been a mainstay in the community since 1936. 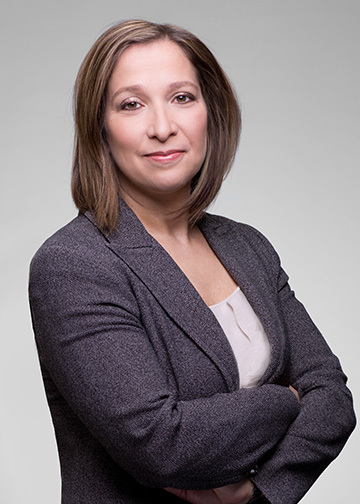 Sandra has been recognized by Best Lawyers in Canada in the practice areas of Alternative Dispute Resolution and Corporate and Commercial Litigation, from 2011 to 2018. “L’Émergence de fraudes électroniques: Comment combattre le vol d’informations confidentielles par des employés?”, published in Premières en affaires (Winter 2010-2011). Sandra has spoken on changes to the Québec Business Corporations Act and on the advantages and challenges of arbitration.